Doc Teters, you can barely see the green visor but it’s there, along with his vest and bottles of medicine in his old timey practice. The first doctor I remember in my childhood was, as we called him, “Old Doc Teters” (pronounced like “meters”). Walking into his quaint office in the small burg of Middlebury, Indiana, was like stepping into a museum from the 1920s. It smelled of antiseptic, like rubbing alcohol. The floor of the waiting room was wooden and the chairs, if I remember correctly, were just plain wooden benches, like old TV programs “Little House on the Prairie” or “Dr. Quinn, Medicine Woman.” Doc Melvin Teters’ father, B. F. Teters, was also a doctor. So his son Melvin maintained the passed-down office décor of his father. 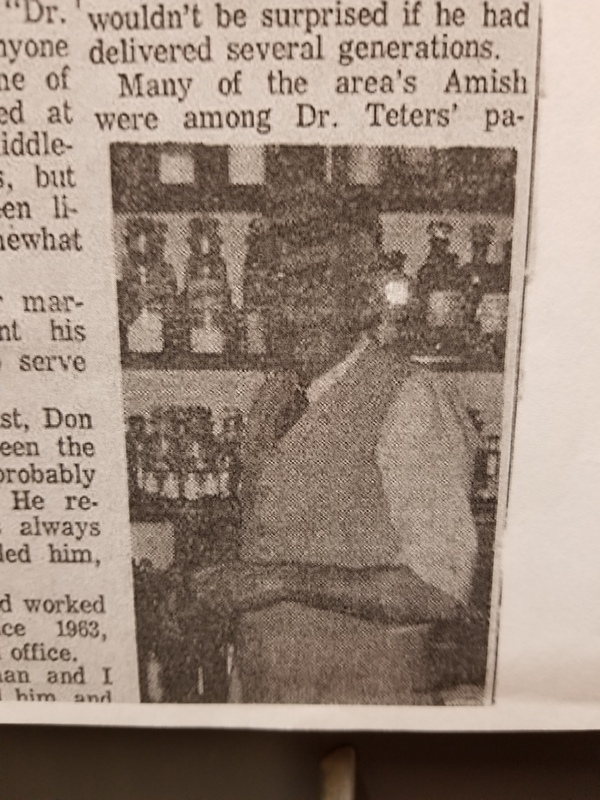 An article I have from the Middlebury Independent notes that local Amish families were fond of having Doc Teters as their doctor, especially since he made house calls. After he died, several of his Amish patients came to rake and clean up his yard since the sister with whom he lived had also just been hospitalized, according to the article. 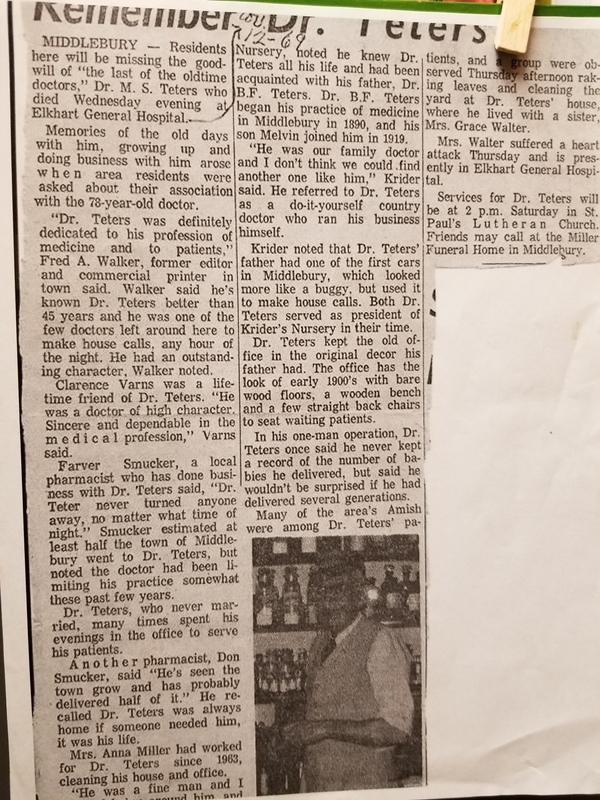 The paper said he was “the last of the old-time doctors,” delivering “generations of babies.” He died November, 1969, shortly after my family moved to Florida. But I had totally forgotten he may have saved my oldest sister’s life. Nancy was just seven when she developed intense pain in the lower right region of her abdomen. My parents called him asking how long it would last. Mom remembers Doc saying, “Well how long do you want her to live? You need to get her to the hospital right away!” This early hospital experience left her with a strong desire to become an RN and she enjoyed a long career until she fully retired last year. She also remembers sitting beside him for him to pull out a splinter under her fingernail—a very painful place. She almost fainted but was steadied with Doc Teters by her side. As a child, I never dreaded going to Doc Teters because he knew how to make a doctor visit fun: he wore an old timey green visor, glasses, and a sweater vest. The shelves in his examining room were lined with glass bottles bearing white piles of powder—and huge yellow sulfa pills that would usually make a sore throat go away almost immediately. He would shake down his thermometer swinging it from a string in a big circle: that was just plain amusing. If you were getting a school or athletic physical, he tested your heart by asking you to jog 10 or 20 seconds and then declare you “as healthy as anyone else would be.” Physical all done! He gave free pre-camp physicals when we went to Bible Memory Camp. I also remember a time he tightly tied a string around a wart on my brother’s forehead. It eventually fell off as he said it would. Many of us have memories of doctors who made house calls, or open their doors on a Sunday morning if necessary. Once when my sister was visiting us here in Virginia, her baby daughter had obvious pain in her ear and we called Dr. Huffman. He quickly dispensed a prescription and she soon felt better. Medicine has changed much in 60+ years but there are Doc Teters out there who still care deeply for their patients. While house calls are out of fashion, we all appreciate the docs who take time to really talk with you, not at you, who go the second mile in making sure you get set up with a specialist if needed, who make their staff available to answer questions and actually get back to you in person—not call you with a message-leaving mechanism. Insurance practices and hospitals where you are seen by “hospitalists” instead of your family doctor make practicing old-style medicine difficult. But even hospitalists who take the time to really listen, explain, and explain again—help. Plus patients need patience to keep asking until we feel we are truly heard. And old-style medicine wasn’t always the best, obviously. We were never sure at the end of one of those cheap or free physicals from Doc Teters if jogging in place for 10 seconds was a true test of a flourishing heart! He thrived on taking care of his patients. I feel privileged to know a few of those today. If you have a doctor like that, make sure he or she knows how much the extra attention and care is valued. We appreciated my husband’s surgeon praying respectively to the Great Healer with us before operating a few years ago. Did you have the privilege of going to an old-timey doctor? Or perhaps he (or she?) made house calls? I’m all ears right here. I’d love your comments! Do you have a favorite doctor you recall or go to now? What makes this doctor a fav? that is available in most communities today. Send comments or stories to anotherwaymedia@yahoo.com or Another Way Media, P.O. Box 363, Singers Glen, VA 22834. In my day (! ), doctors made house calls. Dr. Thompson delivered me, and Dr. Garber came to our house to give injections to one of my sisters who had rheumatic fever. You met the latter in one of my memoir chapters, treating my mother’s allergies. Great descriptions, Melodie! Your doctor delivered you at home? I suppose that was not uncommon–my mother’s generation and community were delivered at home–and she recalls being shocked when her brother was born because her mother’s pregnancy had been hidden from her and her sister. That was not uncommon either, I understand. Now we have “gender reveals” and posting photos on FB of big tummies: my grandmother Stauffer must be rolling over in her grave. Or maybe she’s dancing in heaven!